WASHINGTON, DC, May 11, 2017 (ENS) – By a two-vote margin, the U.S. Senate voted Wednesday to uphold an Obama-era regulation to control the the venting and flaring of the potent greenhouse gas methane from oil and gas wells on public lands. Senators voted 51 to 49 to block consideration of a resolution to repeal the 2016 Interior Department rule to curb methane emissions. Three Republican Senators: John McCain of Arizona, Lindsey Graham of South Carolina and Susan Collins of Maine, joined Democrats to defeat the resolution. The vote was the first defeat of a resolution under the Congressional Review Act to undo regulations imposed late in the Obama administration. The Senate has disapproved more than a dozen such rules, including one protecting streams from coal waste and another allowing increased killing of wildlife. “While I am concerned that the BLM [Bureau of Land Management] rule may be onerous, passage of the resolution would have prevented the federal government, under any administration, from issuing a rule that is ‘similar,’ according to the plain reading of the Congressional Review Act,” said McCain. Eliminating the rule was a major policy priority for the Trump administration and the oil and gas industry. President Donald Trump had sent Vice President Mike Pence to the Senate floor to break a possible tie vote. But with three Republicans breaking from the party line, Pence could not act. “People of America and people of the world can breathe a sigh of relief,” said Senator Chuck Schumer of New York, leader of the Senate Democrats. Senator Edward Markey of Massachusetts, a Democrate on the Environment and Public Works Committee, applauded the vote. Markey has introduced the Fuel Loss Abatement and Royalty Enhancement Act (FLARE Act), to direct the Interior Department to issue precisely these sorts of regulations on the waste of natural gas on public lands. 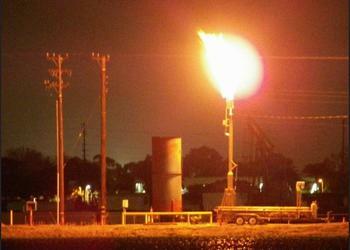 Methane is the primary component of natural gas. If methane is allowed to leak into the air before being used, it absorbs the sun’s heat, warming the atmosphere. While carbon dioxide (CO2) is the most abundant greenhouse gas, methane is roughly 30 times more potent. Environmental groups, naturally, were pleased with the outcome of the vote. League of Conservation Voters President Gene Karpinski said, “This is a huge win for our health, our clean air, and our climate, and shows that President Trump’s plans to unravel hard-won environmental protections are not a foregone conclusion. The American Petroleum Institute, an industry lobby group, was disappointed in the vote and will continue its fight to upend a rule it considers unnecessary, redundant and technically flawed. API Upstream and Industry Operations Group Director Erik Milito said, “America’s natural gas and oil industry supports commonsense regulation, but the BLM’s technically flawed rule on methane emissions is an unnecessary and costly misstep. The rule could impede U.S. energy production while reducing local and federal government revenues. Milito maintains that the regulation overlaps with existing state and EPA regulations and could further reduce activity on federal lands where natural gas production is already down 18 percent from 2010 to 2015. Analysis by Environmental Resources Management on the proposed rule found that the added cost of compliance could result in up to 40 percent of wells that flare on federal lands being permanently uneconomic to produce, said Milito. Based on 2016 royalties reported by the federal Office of Natural Resources Revenue, even a one percent loss of royalties due to loss of production would result in lost government revenues of more than $14 million. “North Dakota has taken successful, proactive steps to decrease flaring and reduce greenhouse gas emissions, while supporting a successful energy industry and good jobs,” she said. The Environmental Law & Policy Center’s Executive Director Howard Learner said his organization devote its year-long campaign to gaining Senator Heitkamp’s support for the methane waste reduction standard. “My concern with overturning this rule comes down to waste – waste of a resource that would power homes and businesses across the country, and waste of royalties that either the taxpayers or tribal communities aren’t getting when methane is flared or vented,” said Heitkamp. Heitkamp said that multiple tribes in North Dakota have expressed serious concerns with overturning this rule, including the Mandan, Hidatsa and Arikara Nation, whose reservation covers an area where one-fifth of natural gas production in the state occurs. Similar regulations at the state level have proven successful in Colorado without harming the economy, yet state rules cannot control the urgent need to reduce methane waste on public lands. 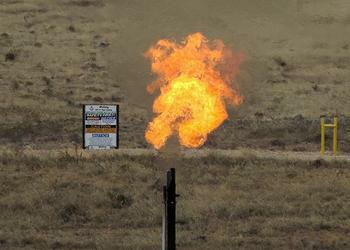 Schlenker-Goodrich says that by requiring oil and gas companies on public land to repair leaky infrastructure and waste less methane through venting and flaring, it is estimated the BLM methane rule could earn taxpayers $800 million in royalties over the next decade and capture enough methane to power 740,000 households every year.